In honor of his latest feature released (The Missing Person – one I hope comes to Toronto, but appears unlikely) and my salivating over his performance in My Son My Son What Have Ye Done?, I felt it only appropriate to talk about him in more detail. This man, Michael Shannon, the most interesting actor working today. It is only fitting that he get nominated for his first Oscar last year for playing John Givings in Revolutionary Road – ironically, one of the few larger roles he has in a film that I don’t nominate him for. Why is it fitting you ask? Well if you’ve been following his career at all you’ll see he’s known for giving appealing turns in performances that are more or less glorified tertiary roles. Be it Before the Devil Knows You’re Dead, World Trade Center, The Woodsman or just about anything else in his filmography up to 2007 (apart from Dead Birds which I will review shortly) he’s done some high quality work in minimal amounts of time a plethora of times in his career up to this point. Even early on in his film career in a small film called Chicago Cab (a film I watched recently but have no intention of reviewing, but I will say John C. Reilly, Gillian Anderson, John Cusack, Julianne Moore and April Grace make for an amusing broken up ensemble) he sports a perfected New York accent mixed with the vocal cracks found in that of a crack fiend (entire performance is here, actually: Michael Shannon in Chicago Cab) which indicates the amount of talent just waiting to burst out of him. Now here’s the aspect of his manner that divides audiences: He comes from a stage background (in fact, runs a production company called A Red Orchid Theater in Chicago) whose style has not altered much from the stage to the screen. He tends to exaggerate every line he’s given to speak in just about everything – especially Revolutionary Road. For me, this is a refreshing style to watch unfold on screen (especially since I haven’t seen much stage acting) that makes the feature he’s in all the more enjoyable. For similar reasons, people may hate him and I’ve no reason to disagree. He’s an acquired taste of sorts – altering the mundane into something eccentric (and for me, wonderful). Alright, I’ll get to some of these reviews now. Rewatched Bug and Shotgun Stories for the entire purpose of making this post as solid as possible. Enjoy! First up will be the film I watched solely for the ability to say “I’ve rounded off all of Shannon’s work” in Dead Birds, a film where, in 2005, even though he was certainly in the top four most important characters, was hidden from the DVD cover as a name at the top. Funny how only three years later he’s the only one from the film to have a good career. Alright, so for a genre film it’s pretty good. You can see everything coming a mile ahead and the initial concept itself is very interesting, but the execution is very flawed, resorting to cheap tricks and thrills rather than building on a potentially interesting plot. The story starts off as a tale about a cavalry of Confederate soldiers – with a black slave and all – who have just robbed a Union bank and killed many people in the process. They plan on heading to Mexico and dividing up the money stolen there. They’re led by ruthless and cowardly man named William (Henry Thomas) who looks like the type of guy you’d never want to trust, throwing these men and their intelligence immediately into question. So off they go to Mexico, but the men sense a storm brewing and decide to take shelter in an abandoned home. As they ride horses, they’ve no form of transportation to leave this area until the storm quiets. So this film is of no real significance and really the only good thing to come of it are the performances. Of course, Shannon is the best of the cast as one of only two characters that seem to be at all fleshed out (the other being the slave, Todd played by Isaiah Washington). He chats down the more aggressive members of the group and delivers plentiful lines with sincerity where the film lacks it. However, the character wouldn’t be nearly as interesting if played by any other actor as Shannon shows his natural peculiarity in the role that I’ve come to love. Next up is Bug, which as I said above, I rewatched for the sole purpose of filling this post out more. Alright, so the first time I watched it I was unaware of who Michael Shannon was (apart from thinking he was ‘awesome’ in World Trade Center the year prior) and went into it expecting Ashley Judd to give one phenomenal performance; as you may recall, Ms. Judd was getting a hefty dose of Oscar buzz for her role in late 2006 until the film got bumped to its obscure May 2007 release. With it, I expected plentiful horror about bugs and didn’t anticipate (nor truly comprehend) the psychological angle of it all, which left me with a bitter taste. On a rewatch, I truly appreciated this for what it was – a manic introspective into the minds of two depressive and erratic people; one looking for a way to subside grievance and the other unable to control their defections from infecting another. Opening on and sustaining a perilous essence in a white trash setting, Bug sets its table immediately and gets to work with just as much urgency. Agnes’ (Ashley Judd) mental structure hits the viewer like a stray bullet in the opening scenes – unexpectedly, followed by some sorrow – which result in being jarred into position for the rest of the film that ensues. Through key conversations that take place over a few days, the viewer gets to understand why Agnes would fall for the mysterious, but adamant Peter (Michael Shannon). With her son being kidnapped and having temporary friends at best, Peter appears to be the only person Agnes has. She loves him because he stays and he loves her because she is as emotionally distraught as he. On top of this, she’s frantic that her abusive ex-husband Jerry (Henry Connick Jr.) is out of prison and attempting to push his way back into her life. Of course, him being tough and her being weak leads the viewer to believe that Jerry can easily overstep the boundaries put up by Agnes for various reasons, but none more important that he is stable and she is not. Thankfully, Peter is in the picture and taking care of Agnes now, but does not feel the need to engage with Jerry as Peter is passive and appears to have a case of PTSD (post-traumatic stress disorder) from his days in the military, as well as various other problems with the government and the experiments he proclaims they performed on him. The most tragic element of this is the psychological angle of it all. Are there bugs? Peter exclaims there are, but Agnes doesn’t see them. He persists and she begins to see things his way. It may be a side effect of Agnes’ meth addiction or her feeling of being indebted to the man, but their relationship builds on this – this trust that no one understands. The final act brings the feature together, and boy, does it ever pile on the anxiety. My only concern with the story is that it doesn’t take the time to flesh out Agnes’ and Peter’s relationship to an admirable point. It’s done well, sure, but after the initial discovery of bugs, the film appears to jump a week or two ahead where Agnes is just as distressed about the recent infestation as Peter. You’re clearly meant to believe that as time grew, Peter continued his persistence and Agnes’ wall slowly fell. Perhaps the filmmakers felt it unnecessary as this would be deemed too tedious to watch unfold, but the story takes what is meant to be a curiosity to the viewer as a poor ellipsis of sorts (a jump in the story that doesn’t give you all the information, but a conclusion: ie. Llewelyn’s fate in No Country for Old Men). What Bug does best is evokes Michael Shannon’s true talent for the first time in his career. When I first watched it, I watched it for Judd – this time I did it for Shannon. In comparing the two leads, Shannon takes this in a cakewalk. While Judd was great in the role, she has a few moments of falseness (ex. whenever she screams) in important scenes that are only balanced out as ‘good’ because of Shannon’s presence. Shannon also had the advantage of having played the role many times over on stage and that translates to the film beautifully. While he is indeed stagey and over-the-top, it fits his portrayal of Peter perfectly. For an example of his perfection, look no further than his little jitters or the punctuality his enforces in his major monologue at the end. Purely genius. Wow, I’ve spent far too long on this post and it’s really hindering my opinion on relative films, so I’ll keep this one short so I can get to more important reviews (35 Shots of Rum, for example) within the week. After making Ebert’s Top 20 of 2008, Shotgun Stories became a film that many wanted to see. For me, the idea of Michael Shannon in a leading role wasn’t too appealing, but I trust Ebert after he guided me to a surprisingly pleasant viewing of the lambasted Lakeview Terrace. Although the first viewing perturbed me as I figured this would be a story more built on bloody vengeance than emotional dystrophy. On a second viewing, I appreciated the context of the story and the theme it conveys far more and find myself appreciating Michael Shannon’s performance more than ever. Speaking with subtlety, writer/director of the film Jeff Nichols wholly recognizes how to demonstrate somber tales in mere names. The film begins with a bitter woman arriving at the front of her son, Son’s (Michael Shannon) doorstep announcing that his father has died. 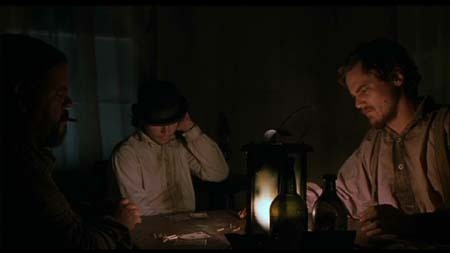 He, along with his brothers Boy (Douglas Ligon) and Kid (Barlow Jacobs) appear very indifferent to the news and for good cause. Immediately with the names of these character, the viewer is given insight into how careless their father was and how miserable he treated his children. Their angst and bitterness towards the possibility of going to his funeral is just and while the story seldom has moments of loud bursts of angry dialogue, the audience grasps the hatred coursing through these three men’s bodies upon hearing the news. So much they wanted to say but didn’t – and not for the greater good either. Tension heats up almost immediately when the brothers go to the funeral and see three more brothers and a grieving woman there. Apparently Son, Boy and Kid’s father left his first wife, straightened out his life and married into another family as a Catholic, having a few more children with this woman. Son spits on his casket after a softened tirade against how he wasn’t a good man and boom, you have your conflict between two families that could be considered brothers themselves. What you won’t get from Shotgun Stories is a sense of relief. There is no penultimate climax that resolves everything (for better or for worse); there is no heated argument that leads to tangents breaking off and one man left standing; there is nothing but simplicity and a story about men who grew up bitter and are trying to relinquish themselves from the shackles of childhood. A better description of this is fleshed out with the introduction of harebrained Shampoo whose main concern in life is finding a place to park his car. There is also a contrasting element of a sort of ‘diamond in the rough’ analogy going on for the setting and the characters trying to preserver. Boy is considered a success with his brothers even though his wife wants to leave him because his obsession with gambling is growing insufferable, whereas Boy lives in his van with his dog and teaches youths in the area the fundamentals of basketball as a profession. Even though Boy finds himself a failure, he is truly happy teaching what he loves and living with simplicity as opposed to Son who is on the verge of drowning in debt and about to lose his wife and son. I suppose you could also tack on a “money is the route of all evil” theme on this as well, making Nichols’ first feature more multifaceted than most others that came out last year. In the end, this film is more in tune with the core detriment most people are faced with and that is not being able to give up on familiarity to become something better. With Son’s former math skills hindering him from being a good father, Kid’s ideal woman coming into his life after he was rejected by her on repetitive occasions when they were in high school and just wanting to marry her, the redemption they all want for the mistreatment they got slapped across them by their father – it all equates to this one undying theme that will live on from generation to generation until we are extinct. For finding and budding a single truth in an industry built on deception and the obligatory “make the audience happy” factor, I commend Jeff Nichols. This entry was posted in Artists in Retrospect.